Various Mobile Phones manufacturer are launching new version smartphones, Tablets, iPhones to increase their share market in Mobile group. Recently a survey reported that mobiles are swiping and crossing states by changing IMEI (International mobile equipment identity) with simple software's available online. 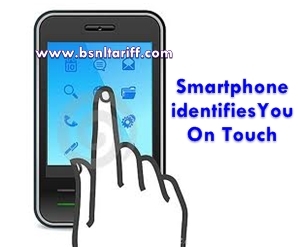 Recently US-based scientists have developed software which enables identifies smartphone mobile user on touchscreen. This software developed inbuilt sensors to record the UP (Unique patterns) of pressure duration, fingertip size and position of each mobile users when interacting with Mobile phone or Tablet. Scientist reported that, this new version software turn touch or impression into a signature that identifies the Mobile users and lock out anyone whose usage patterns do not match. When smartphone user busy at using apps or playing games software stops checking users identity. At the time of using sensitive application (Email or SMS) software automatically switches on.